Any property owner understands that there are some maintenance issues that you just cannot get away from. These might be easy to achieve like house washing or siding cleaning, or complicated like gutter cleaning but the most inconspicuous chores are the worst. Even though windows are some of the most important aspects of your property, they are often ignored. Creating a routine for your Aldergrove window cleaning keeps your glass in good condition while you focus on other aspects of your home or workspace. Dirt and grime happen. There is no fighting naturally occurring buildup, but there are ways to treat it properly. Wiping down interior windows is possible from several positions but exterior window cleaning requires a bit more technique. When shopping for any type of property, natural lighting is a major selling feature. Whether selling, buying or just needing an update to your current work or living space, windows make a huge difference. These simple panes of glass are vital to the running of your property but they do not get enough credit! Windows control lighting, impact heating and have a direct effect on quality of life – so let us help keep them in good condition! 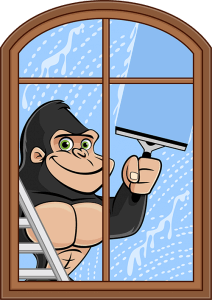 Regular use of Gorilla Property Services’ Aldergrove window cleaning services extends the life of your windows and protects your wallet! In a place as beautiful as Metro Vancouver, it is important to take in all the sites from every outlet. This could be viewing stars from skylights, assessing the weather from living room windows or letting sunlight into a workspace. These might be reason enough to keep interior and exterior windows clean, but there are more to these fixtures than just aesthetics. Dirty windows might give off a bad look, but they can also lead to a lot of damage and unnecessary costs. Glass itself is a porous material. Windows might be able to keep unwanted items out but lighter fare has a habit of catching and sticking along window surfaces. Without proper window care, sitting items and foreign materials will seep into the pores of these materials, degrading them from inside. This weakens materials and can lead to breakage. Added window expenses come in many forms. Proper window washing extends not only to the glass itself, but to the surrounding sills and frames. Complete and professional assessment of your windows covers top to bottom inspections. In the same way that sitting dirt or grime can wear down windows, they can have the same affect on the surrounding areas. As materials around frames begin to break down and can lead to drafts, rot and water damage. Instead of throwing money at unnecessary repairs, choose a cost-effective routine! With all the right tools at our disposal, Gorillas can reach windows up to four storeys, so problem areas aren’t so problematic! Treating windows is a complicated enough endeavour but treating them right is even worse. Instead of grabbing a rag and rubbing windows down, more select tools are necessary for great results. Eco-friendly cleaning solutions are used for a gentle, but effective clean while rubber squeegees clear surfaces completely. For those windows that are out of reach, water-fed poles can reach and scrub glass and the surrounding area.